Located on a unique 12-acre setting replete with field, forest and stream, BAJC’s Outdoor Synagogue Project will build a platform for outdoor services and classes, add interpretive signs to a network of trails, and create a space for Mikvah down in the stream. This will be done with the goal of reconnecting sanctuaries and worship to the natural glories that inspire awe and wonder. 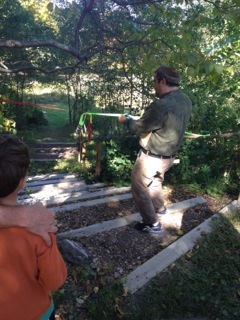 The new space for outdoor services and classes will be connected by a series of trails to their Shmita orchard, holiday gardens, milkweed grove, storytelling tree, and the rest of the land. The new Kiosk and signs will welcome and orient people to the uniquely Jewish nature of their synagogue gardens, orchards, and trail system. Lastly, they will be able to develop a proper Mikvah down in the stream. For the first time their whole community will have a way to immerse in the hope of Mikvah and deepen their welcoming of Shabbat, other holidays, and important personal moments.